Bob Zahradnik, operating director of the Southern Ute Growth Fund, pauses in the lobby of the fund’s headquarters in Ignacio. 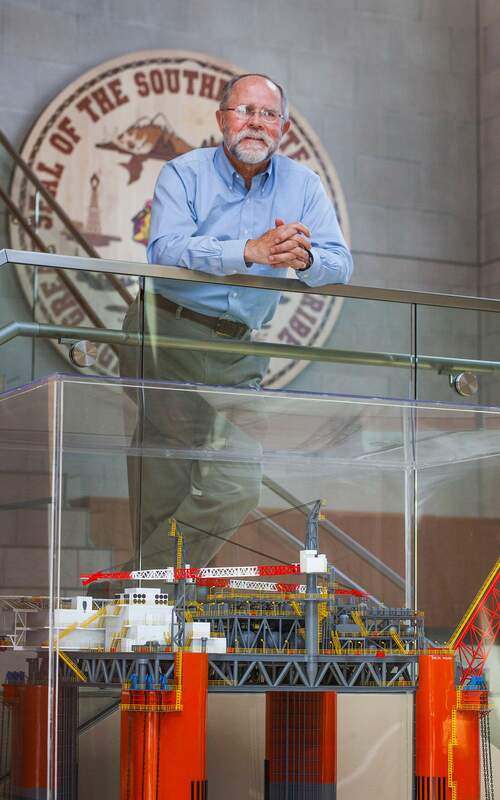 Zahradnik, who has been key to the tribe’s development of its gas and oil resources, is retiring after a 28-year career with the tribe. “The key to success is information,” said Bob Zahradnik, operating director of the Southern Ute Growth Fund. He plans to retire in July after spending 28 years helping to guide the tribe’s successful business ventures. Bob Zahradnik became an employee of the Southern Ute Indian Tribe as the reservation was on the brink of an energy renaissance, which was the spark that contributed to the tribe’s multi-billion dollar net worth. 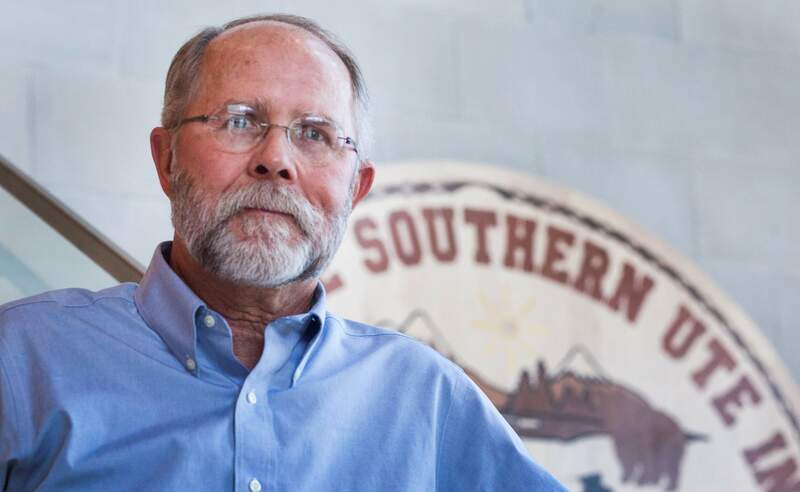 But after 28 years of facilitating great strides in energy resource development and investments for the tribe, the Southern Ute Growth Fund’s operating director is retiring. In 1988, Zahradnik was a senior engineer for Exxon in New Orleans when he was told he would be transferred to “the worst place on earth:” west Texas. Instead, he left for Durango, where he had spent most of his free time when he worked in a Farmington oil field years ago. Zahradnik planned to work as a freelance writer, pitching articles to Runner’s World and outdoor magazines, but found that pursuit was neither consistent nor profitable. But the tribe was hiring, and he became its first engineer. “In the late 80s, it (the boom) was coming,” he said. Reserves that had been harvested since the early 1950s were nearly depleted, but methane-rich coal seams presented new opportunities as new technology emerged. With this knowledge, the tribe began to buy back leases, with no help from skeptical investors. Zahradnik developed a plan of action for Red Willow, the tribe’s oil and gas development company, which was established in 1992 with an initial investment of $8 million. Zahradnik subsequently launched an initiative to assemble an extensive geologic database detailing resources throughout the reservation. It was the tribe’s gateway to successful extraction. Red Willow’s inception laid the groundwork a plan to launch the Growth Fund in 2000. Separate from the permanent fund, which pays tribal government and tribal members, the Growth Fund is dedicated to investments in energy and real estate. The Tribal Council approves Growth Fund business plans and projects, but does not micromanage day-to-day activity, Zahradnik said. The entities meet jointly twice monthly and the Growth Fund is audited annually. The Growth Fund employs about 550 people, 10 percent of whom are tribal members and another 10 percent non-tribal local natives, such as Navajos. Seven entities report to Zahradnik – Red Willow, Aka Energy Group, natural gas gathering and treating company Red Cedar, the real estate branch, private equity, Southern Ute Alternative Energy and the tribe’s Department of Energy. But over the past two years as extractive resource development has been scaled back and oil and gas prices sank, “mass amounts” were cut from the capital budget. Zahradnik declined to provide specific figures about the fund’s net worth, profits and losses. Meanwhile, the tribe is in the early stages of developing a supplemental environmental impact statement to allow fracking on four shale formations on the reservation and up to 1,500 wells. “I don’t know if there’s going to be a fourth chapter,” Zahradnik said, referring to another boom. “The key thing with the shale revolution: There is almost limitless gas in Ohio and Pennsylvania, and they’re very close to the markets, so it’s hard to compete with that. But Zahradnik won’t be around for that venture; he expects to leave his position before July. He’s eyeing a future filled with trout, not extractive resources, with plans to spend retirement fishing. “Bob Zahradnik has been absolutely essential to the success of the Southern Ute Indian Tribe, and has helped carve our place as a leader in Indian Country and a model for tribal economic development,” Tribal Council Chairman Clement Frost said in a statement.